I arrived in 2008 and lived in the Sant Antoni neighborhood of Barcelona for several years. Nothing foreshadowed the change that was coming. They told me that, after years of commercial splendor, the neighborhood was in decline despite its proximity to the central Plaça Universitat and Plaça Catalunya. The effervescent life then was in the Raval, even in the Poble Sec … the Paral.lel pointed ways, but did not decide to hatch as a top zone. The neighborhood of Gracia was still on the rise. Today, talking about the Sant Antoni neighborhood is for many people talking about gentrification and the real estate boom. For others the place has been touched with the magic barite of modernity, they see its trendy side. The point is that it is fashionable. With all the good and the bad. From Barcelonina we like to talk about Barcelona as we see it and feel it, without beauty filters or photo-post tricks, but today’s story is about one of its good things. In reality, a renaissance: the Sant Antoni Market. Unbeatable location for a market. This, when it was not yet the modernist building that we know now, was located outdoors near one of the doors of the wall that surrounded the city. Barcelona grew by leaps and bounds and needed places to buy food. People and merchandise made the place prosper. The Cerdà plan already contemplated the need to turn it into a permanent market and entrusted the architect Antoni Rovira i Trias with the construction of an adequate structure. 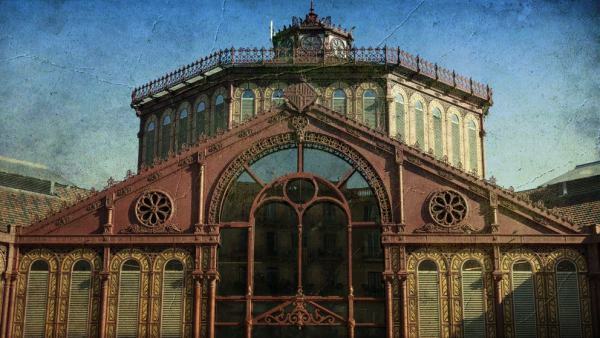 They set to work in 1879 and three years later it was ready to be inaugurated by the mayor of Barcelona, ​​Rius i Taulet. The resulting building made an impression: an iron structure with towering windows, with a circular central area with a panoptic function and four crossed arms extending like the blades of a mill. All covered and with wide lateral cornices to protect the external stops of the sun or the rain. If you like the Mercat del Born, the similar style of this will also please you. 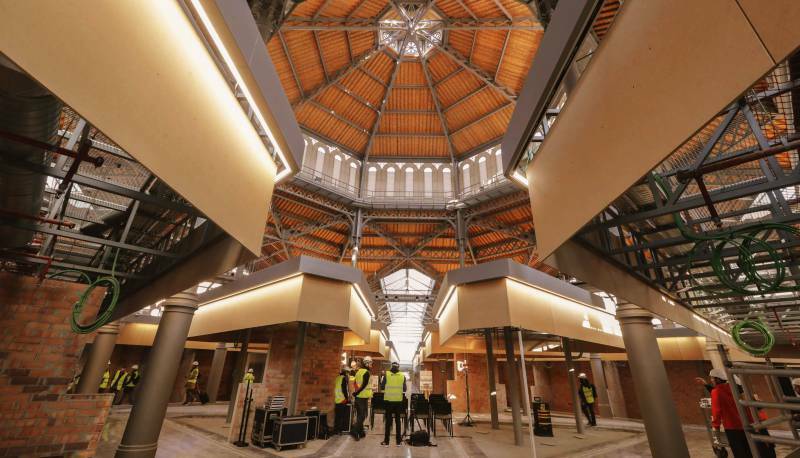 Soon the supply of food is extended to other merchandise and around the building a Mercat dels Encants is created, almost completely occupied by merchants of the textile industry and household items. The entrepreneurial and commercial activity of the neighborhood was again demonstrated when, later, the space also accommodated a third market: the Sunday Market of Sant Antoni. New and old books, postcards, posters, magazines, stickers, stamps … The booksellers and the collectors of diverse items met with the public every Sunday turning this place into a rare example of urban market with activity every day of the week. It is said that the second-hand book market, also known as Fira de Bellcaire, was an inherited activity of the existed between 1920 and 1936 in the Paral·lel. All kinds of objects were offered there, but the sale of books prevailed. 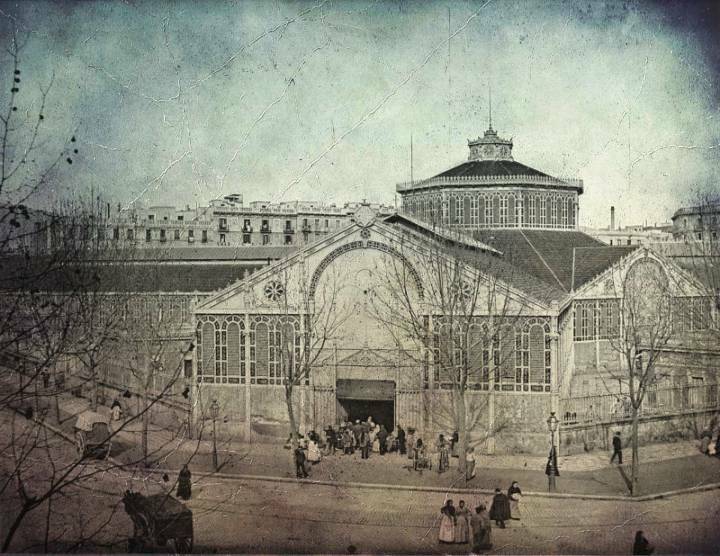 To cope with the inclemency of the weather, they organized themselves in an association and managed to get the City Council to offer them a place under the wide marquees of this market, and this was the start of an activity that was very well received by the people of Barcelona. 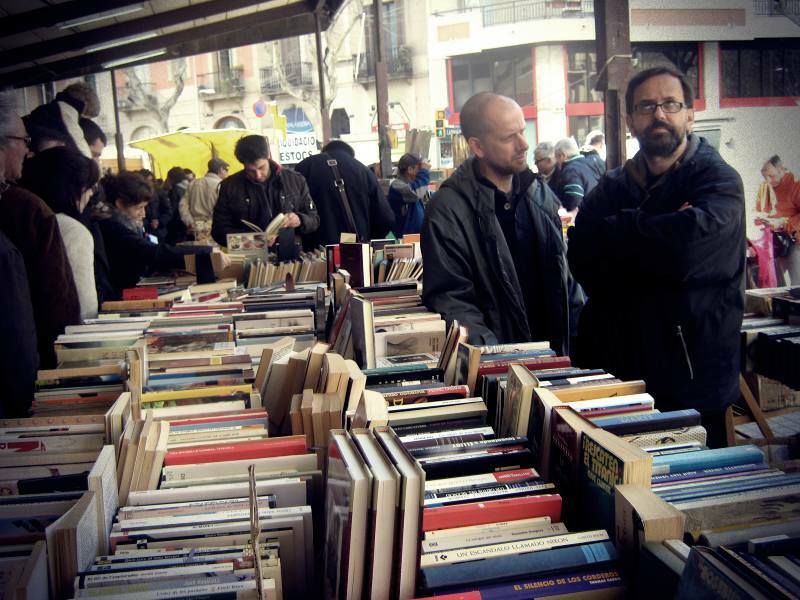 Since 1936, people of all types, including prestigious intellectuals (it is said that during Franco’s dictatorship in Sant Antoni, people clandestinely sold or exchanged forbidden books), went to buy or just walk among its crowded stalls. Going to Sant Antoni Market on Sunday mornings, became a regular activity in my family. The ritual had no mysteries: a couple of laps to travel the corridor in one direction and the reverse, perhaps an exchange of cards and, near noon, a vermouth. Interestingly rainy Sundays were my favorite to move in concentric circles through this paradise of second-hand books. It was cool to go with friends rivaling in locating the weirdest specimen or buying many things boasting about the low price we had paid. Going with my father was another party because with him we practiced the buying and selling and if the “business” was favorable the vermouth was luxury. During the week there was the purchase of provisions, the fish in particular rivaled in quality and freshness with that of La Boqueria; but it was also great to go with my mother to get lost among the clothing stalls where the merchant, with a long hook stick, was hanging up and down the exposed clothes as if it were a gigantic clothesline. I was fascinated by the moment in which the stalls were dismantled and the goods were put into large wooden boxes with wheels that some young men were responsible for pushing towards the stores around. Now they are going to replace them with lighter ones. Pity though I’m happy for the young men. 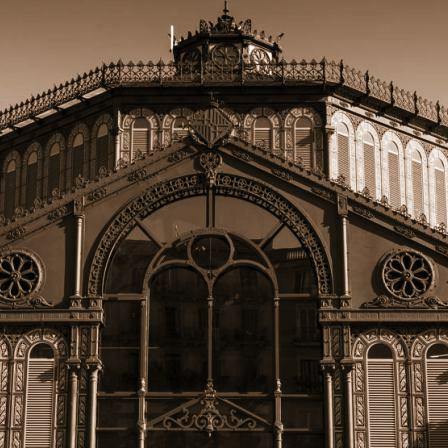 The beautiful structure built in the nineteenth century began to show symptoms of fatigue and in 2007 began a period of renovation work that involved the transfer of the three markets to structures provisional prefabricated in the adjacent streets. The rehabilitation process suffered several delays, the most important of which was motivated by the discovery of archaeological remains. After these long and controversial works, the market has been reopened in 2018 under the mandate of the mayor Ada Colau and her government team that has insisted that the new market must serve to preserve the essence of the neighborhood. Time will tell if it succeeds. We wanted to take advantage of the rehabilitation of these more than 50,000 square meters to build a parking and urban equipment. The site has innovations that visitors will not be able to perceive at first glance, such as, for example, the sustainable energy climate control system. Other developments are more evident. The surroundings of the Sant Antoni Market have become a semi-pedestrian zone in which many of the bars and shops are also getting their best face to catch up with the brand new market. There is hope for this new stage as evidenced by the number of visitors, 60,000 to be exact, among neighbors, locals and tourists who came to know the new market. One of his most endearing characters, the wizard and astrologer Felix Llaugé Dausà, known as the Mago Felix, dedicated the second Sunday of his opening to bless the facilities, its workers and customers. He was accompanied by the journalist Pere Vall, whose brother Joan Vall has run for almost twenty years a stall specializing in film collecting and some former merchants who wanted to see the news first hand. I have to say it was raining, but that, as always, was not a problem. It allowed us to complete the ceremony: breakfast, good conversation, walk along the stalls and finally go to do the vermouth. As a complement, and even as an alternative to the Mercat de la Boquería, the visit to the Mercat de Sant Antoni should be included in your planning to visit the city. If you need more reasons I will tell you that the gastronomic offer of the area is second to none. Word of Barcelonina. Tip: Some nearby passages still keep the typical wooden cars to store the goods when the stalls are dismantled every day. Do you know that 400 cars were used? Let’s see if you see any.